This past Tuesday night I was at home when I got a phone call from one of my friends, Catherine. C: "I was wondering if you could make my mom's wedding cake for Sunday." It's also about the size of my pinky... and I have some small hands. 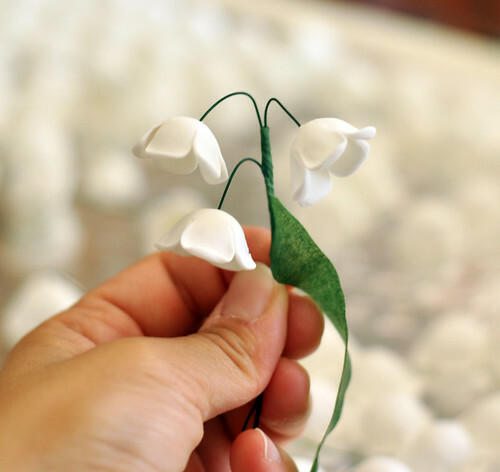 I tried my best to recreate these small and delicate flowers. 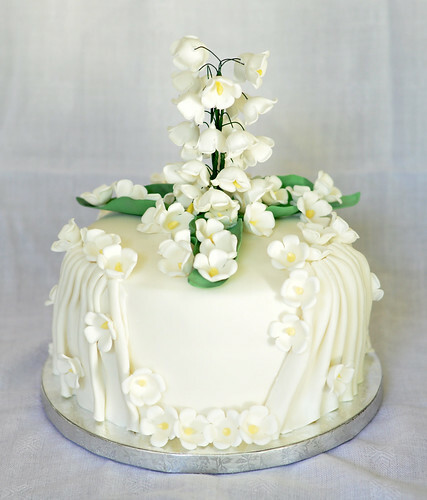 For the flowers I used Gum Paste which is another type of sugar dough that's used specifically for sugar flowers. 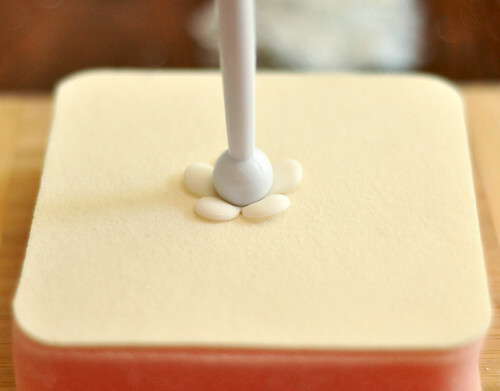 This was my first time using gum paste only because previously I had always used fondant. 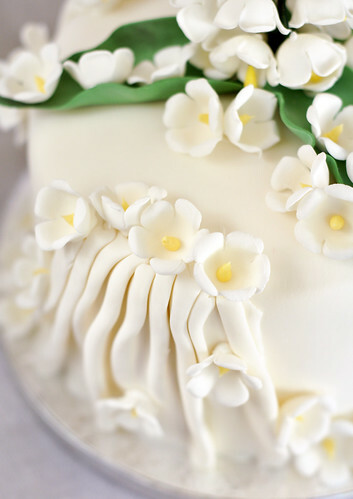 When I first learned how to make sugar flowers it was in culinary school and for some reason they told us to use fondant. I think they were trying to save money by not buying gum paste. 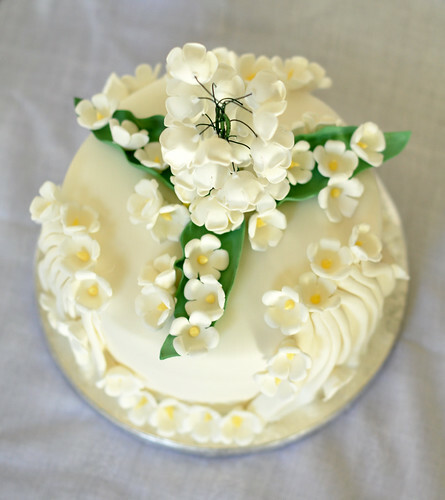 It was really hard getting the flower petals to do what I wanted it to do because the fondant was so flimsy. After using gum paste I definitely won't go back to using fondant. It dries faster and harder. Of course, the downside to that is that you have to work faster to get it the shape you want before it starts to crack and dry. 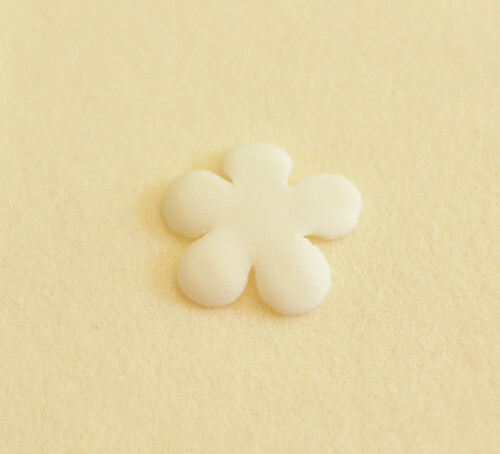 I used the basic 5 petal flower cutter that came with the Wilton sugar flower making kit. You take one of the tools with the ball at the end and thin it out. 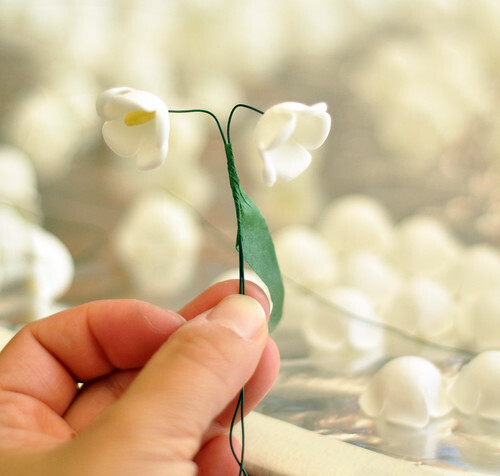 I use circular motions until the ends of the petals are paper thin.. or as close as you can get without breaking it. Then I turned it over because the flower's petals flip towards the outside. That way, it's already curved out when I shape it into the flower. Next, I used the bigger ball to make an indent into the flower. The petal's edges should already be flipped out but I pushed it up further with my finger. At this point I took a toothpick and made a small hole in the center of the dome so after it hardened I could put the wire through without a problem. 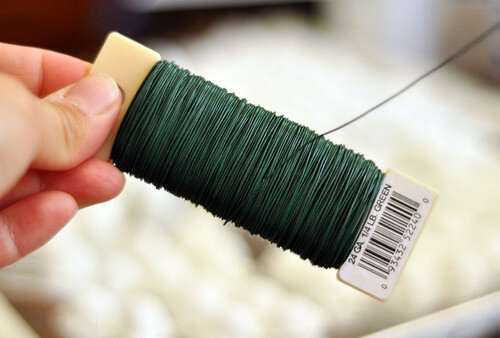 For the stem I just used a green colored wire that florists use. After cutting the wires into about 6" long I bent the end. If you don't do this then the stamen you put on the end will slip right off. Then I took some of the gum paste and colored it yellow. 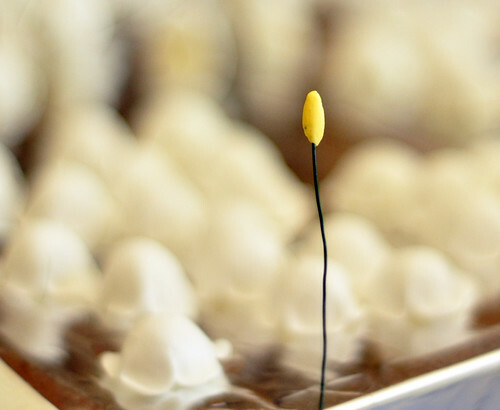 A small piece was used to form around the wire to create the stamen. Right after, insert it into the petal. I had issues with it not staying in place. 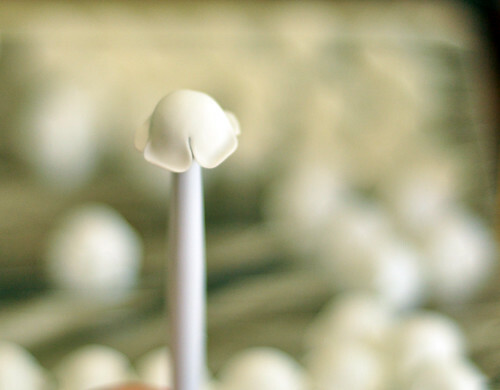 In the end I piped royal icing on the dome part of the flower where the wiring came out. Next time I think I'll pipe on the inside.. and let it COMPLETELY dry before messing around with it. 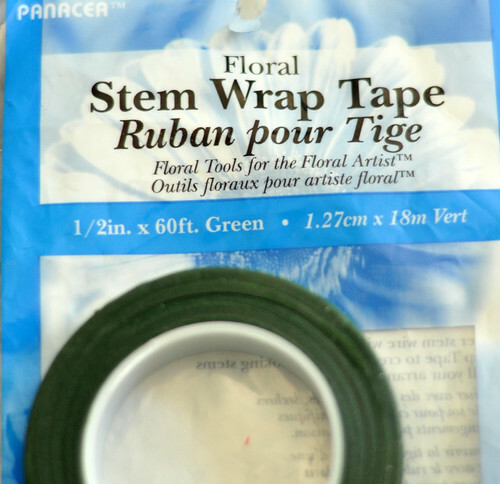 To create that long stem with all of the flowers coming out of it I took some floral tape to bind them together. 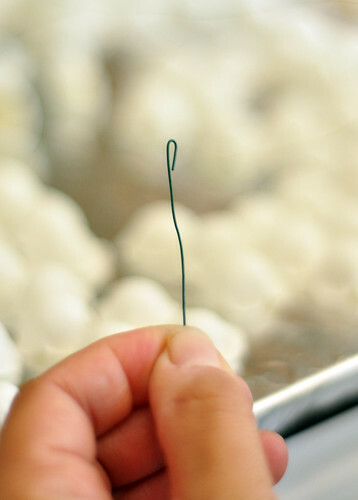 If you've never worked with this before a tip is that you have to pull on it as you wrap. The tape expands and when it does it comes a little sticky. So at first I bound 2 together. Then I wound it down a little bit before adding the third... so on and so forth. Doing all the flowers took me well over 6 hours. Those two holes are there because right after I covered it there were bubbles that I tried to squeeze out by poking holes with tooth picks. I guess it didn't work because where it was cracking open was a HUGE air bubble. Arrg.. I don't know what I did that made it do that. 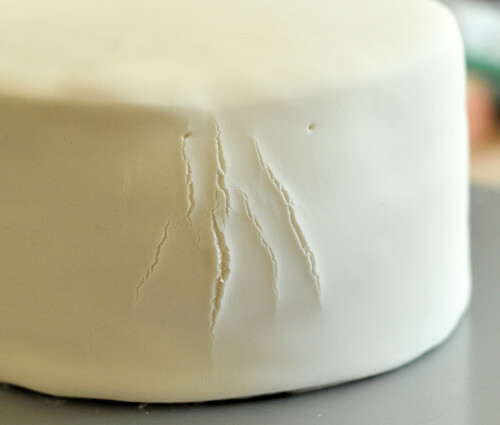 I squeezed as much air out as I could but was then left with a section of cracks and bits of buttercream oozing out. I was planning on covering it up with some leaves I had made but it was waaay too big. 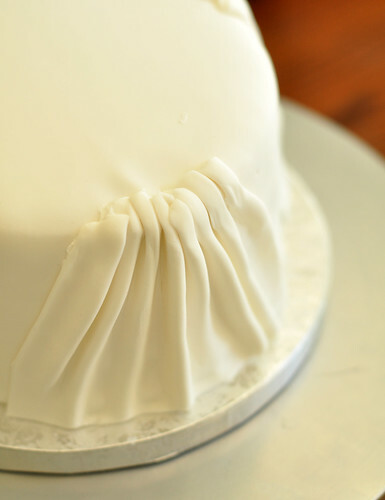 Pondering what I could do to cover my mistake up I remembered an episode of Cake Boss where Carlos covered up a huge sagging bottom tier with drapes of fondant. Sounded good to me. 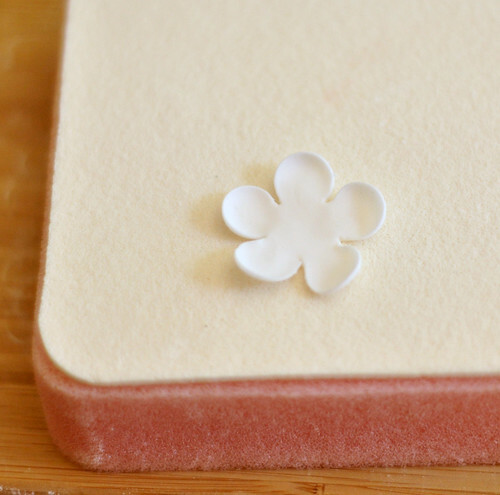 I rolled out some fondant and cut a rectangle. Then I put some skewers underneath it to create the folds. 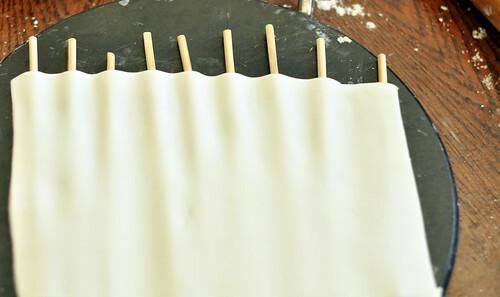 Then I used some royal icing to paste the drape on... trimmed the excess and viola! Mess up covered! 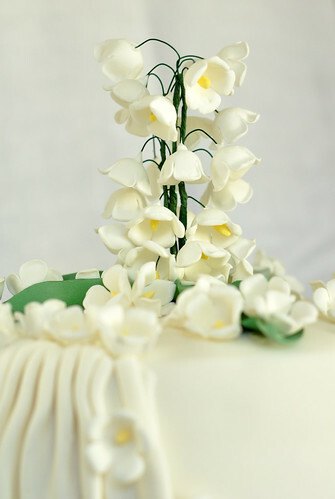 I did 2 more like it around the cake then fumbled around with the flowers to figure out how to decorate it. As I mentioned before, this was my first official I'm-Getting-Paid-For-This wedding cake so lots of things occurred to me afterward. Like how it's probably a good idea to know what you want the cake to look like before actually building/decorating it. This is why on all those cake shows/competition they always do a sketch before doing anything. Oh well, you live and learn right? 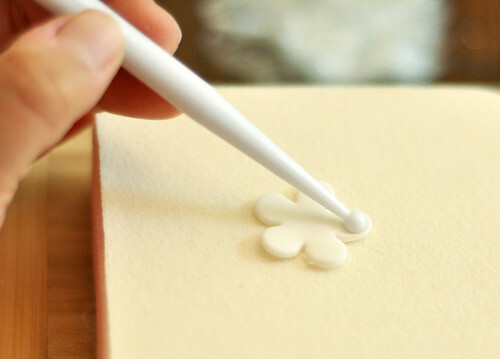 What I had originally thought of doing didn't quite work so I ended up just piping the stamens in the flowers with yellow royal icing to paste it individually instead of assembling them into one stem. In the end I used the ones I had made with the wiring in the center of the cake. I'm a perfectionist so I can't say I'm completely happy with this but it definitely turned out better than what I thought might turn out earlier this morning. holy wow, nadia...i am so impressed. beautiful! Haha thanks Eileena! It means a lot. What a beautiful cake! Pristine and so spring like. I really love the dainty Lillies of the Valley. Wow! wow nadia!! u are sooo incredibly talented!! that cake is gorgeous!!! 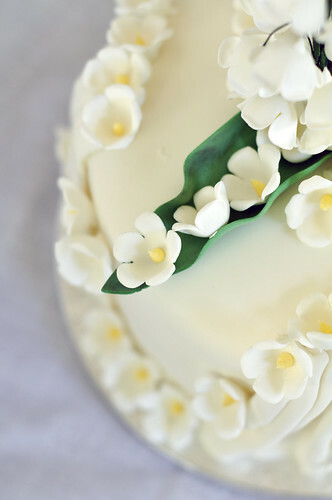 I admire people who make wedding cakes! they must somehow posess some sort of bravado and quick thinking and stress control characteristic. the flowers look real!